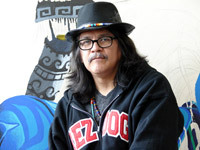 Lawrence Paul Yuxweluptun, graduated from the Emily Carr School of Art and Design in 1983 with an honours degree in painting. Yuxweluptun's strategy is to document and promote change in contemporary Indigenous history in large-scale paintings (from 54.2 x 34.7cm to 233.7 x 200.7cm), using Coast Salish cosmology, Northwest Coast formal design elements, and the Western landscape tradition. His painted works explore political, environmental, and cultural issues. His personal and socio-political experiences enhance this practice of documentation. Yuxweluptun's work has been included in numerous international group and solo exhibitions, such as INDIGENA: Contemporary Native Perspectives in 1992. He was the recipient of the Vancouver Institute for the Visual Arts (VIVA) award in 1998. The introductory video narrated by artist Lawrence Paul Yuxweluptun is a brief artist statement on the political discourse of his work. Duration: 59 seconds. This video requires the free Flash Player, which may be downloaded from this link.